Following the highly successful screening of vintage film footage in Alvinston, Lambton County Archives is looking for the public's help in locating and digitizing more old film from across Lambton County. A screening of film footage captured in Alvinston during the 1940s attracted more than 130 residents to a recent viewing at the Alvinston Library. Lambton County Archives believes the popularity of the event demonstrates there is an appetite for more vintage local films and hopes to expand its archival holdings beyond traditional documents and still photos to a wider selection of media. "Lambton County Archives would love to digitize residents' 8 mm or other vintage film," says Dana Thorne, Archivist. "Lambton County needs video footage that features our local history. Not only does old film footage offer unique insight into the past, it is also important to create digital copies of this material before the fragile film becomes unviewable." Any film loaned to Lambton County Archives will be screened by the Archivist. If the footage is determined to have local historical significance, the material will be converted to digital format with a copy to be housed at Lambton County Archives. For more details about the digitization project, visit the Lambton County Archives Vintage Film Footage page or contact Dana Thorne at 519-845-3324 ext. 5239 or via email at dana.thorne@county-lambton.on.ca. One of the most interesting pieces of footage to come in so far is the "Stars of the Town" footage from Alvinston. The footage was shot in Februar 1949 by a name named LeRoy (Roy) Harold Massecar. When he was not busy in his fulltime work as a reverend, Massecar travelled across Ontario and filmed the activities in small towns between 1947 and 1949. He would show the video footage in town halls and community centres, charging a small admission for local residents to watch themselves on the silver screen. Roy used silent, black and white 8 mm film to capture approximately 100 Ontario locations. For more information on Roy's other projects, visit the Western Archives page on the "Stars of the Town." 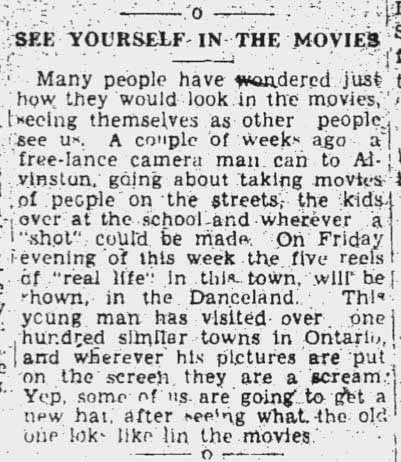 His footage was recorded in Alvinston in February 1949 and screened on March 4, 1949. Two shows ran at 7:30pm and 9:30pm and admission was forty-five cents or twenty-five cents. The Alvinston Free Press published several articles and an advertisement for the event, included below. 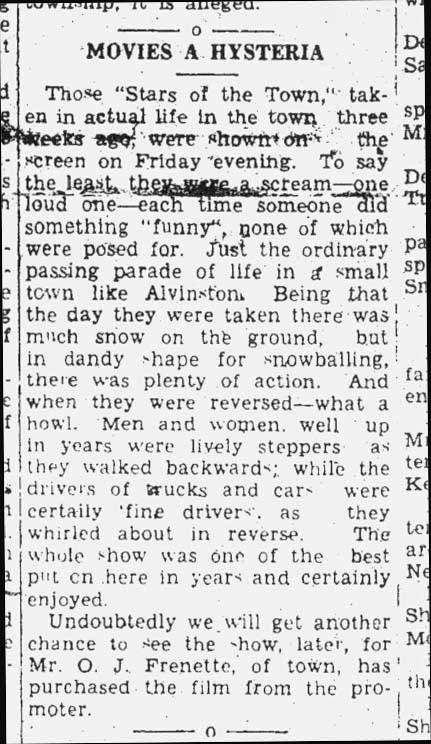 The newspaper reported in the March 9 issue that the screenings were a success: "To say the least, they were a scream - one long one - each time someone did something 'funny,' none of which were posed for. Just the ordinary passing parade of life in a small town like Alvinston." DVDs have been produced with copies of the footage. They can be purchased for $20+HST at the Lambton County Archives (787 Broadway Street, Wyoming) or the Alvinston Library (3251 River Street, Alvinston). Learn more at the "Stars of the Town" DVD webpage.